About Lentil Lentil may have been one of the first agricultural crops grown more than 8500 years ago. Problem Description All the above ground plant parts are infected at different growth stages. All the above ground plant parts are infected at different growth stages. Tan spots surrounded by dark margins and light coloured centre studded with tiny, black, fruiting bodies (pycnidia) appear on the leaflets. Pycnidia are more pronounced in the lesions of old leaves. These may develop oozing spore mass under humid condition. 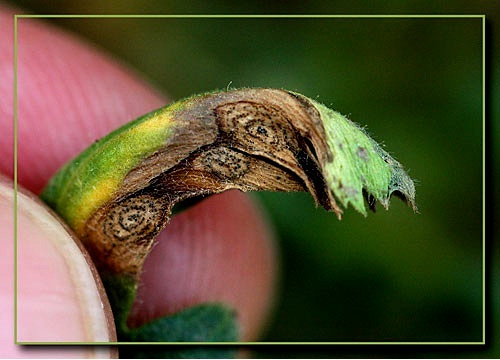 Coalescing of lesions lead to blight and leaflet abscission. The tips of branches wilt turn brown and die. The crop shows blighted appearance. Pods develop lesions and infected areas shows purplish hue. Heavily infected plants develop shriveled and small seeds. The quality of seed is adversely affected.